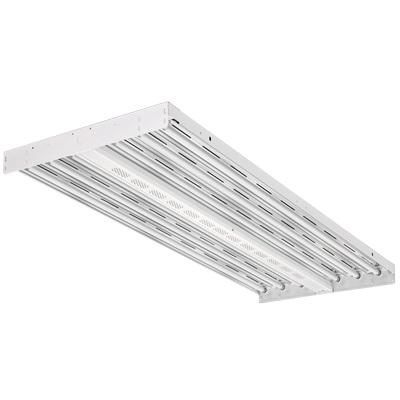 Lithonia Lighting I-Beam® Collection Energy-saving fluorescent high bay fixture has 22-gauge heavy-duty code gauge steel channel with high-gloss white baked enamel finish. Fluorescent high bay fixture uses six 54-Watt T5HO lamps. Lamp with electronic, programmed rapid start ballast has voltage rating of 120 - 277-Volts. Fluorescent high bay fixture measures 48-1/16-Inch x 18-1/8-Inch x 2-3/8-Inch. It is ideal for use in manufacturing, warehousing, institutional and retail facilities. Fluorescent high bay fixture is UL listed and CSA certified.